GENERAL FLOOR MACHINES - JIGSAW FLOORING. (Floor Machine) A power-driven machine equipped with a scrubbing or buffing brush used to clean or polish floors. This econometric study covers the world outlook for manufacturing electric vacuum cleaners, electric floor waxing machines, and other household electric floor care machines across more than 200 countries. For each year reported, estimates are given for the latent demand, or potential industry earnings (P.I.E. ), for the country in question (in millions of U.S. dollars), the percent share the country is of the region and of the globe. These comparative benchmarks allow the reader to quickly gauge a country vis-a-vis others. Using econometric models which project fundamental economic dynamics within each country and across countries, latent demand estimates are created. This report does not discuss the specific players in the market serving the latent demand, nor specific details at the product level. The study also does not consider short-term cyclicalities that might affect realized sales. The study, therefore, is strategic in nature, taking an aggregate and long-run view, irrespective of the players or products involved. This study does not report actual sales data (which are simply unavailable, in a comparable or consistent manner in virtually all of the 230 countries of the world). This study gives, however, my estimates for the worldwide latent demand, or the P.I.E., for manufacturing electric vacuum cleaners, electric floor waxing machines, and other household electric floor care machines. It also shows how the P.I.E. is divided across the world's regional and national markets. For each country, I also show my estimates of how the P.I.E. grows over time (positive or negative growth). In order to make these estimates, a multi-stage methodology was employed that is often taught in courses on international strategic planning at graduate schools of business. Foto tirada da janela do 14? andar do hotel onde ficamos em Florianopolis - SC - Brasil, no centro da cidade, as 9:00 h da manha aproximadamente. O veleiro vermelho me chamou a atencao, por contrastar com as demais cores da imagem - o azul do mar, o amarelo da "casinha" e o verde claro. Apesar de ter usado o zoom 10x de minha maquina, ainda fiz um corte para adequar a uma composicao melhor, eliminando elementos que "poluiriam" a imagem. Com o Photoshop CS4 dei maior vibratilidade, tornei mais nitido, um pouco mais de contraste. Apenas isso, nao houve retoques, nem clonagens e nenhum efeito a mais. Nao ha nenhum processo de edicao, alem dos ja mencionados. Foi uma edicao bem simples. E como muitos atentos e sortudos fotografos apresentam suas inigualaveis e unicas fotos: estar no lugar certo, na hora certa e, principalmente, com a camara na mao. Taken from the window on the 14th floor of the hotel where we stayed in Florianopolis - SC - Brazil, in the city center, at 9:00 am approximately. The red boat caught my attention, by contrast with other colors in the image - the blue sea, the yellow of the "house" light green. Despite having used the 10x zoom on my machine, even made a cut to fit a better composition, eliminating elements that "pollute" the picture. With Photoshop CS4 gave greater vibratility, became clearer, a little more contrast. Just that, no retouching, no cloning and no effect anymore. There is no editing process, besides those already mentioned. It was a pretty simple issue. It's like very attentive and lucky photographers present their unparalleled and unique images: being in the right place at the right time, and especially with camera in hand. Devon General’s second batch of Leyland Atlanteans was delivered during 1960 and consisted of 23 machines (895-917DTT). Although mechanically similar to the first batch, unlike the delivery of the previous year these vehicles carried 75 seat all-metal bodies built by Charles Roe of Leeds to a design by Park Royal. These were immediately distinguishable from the MCW bodies fitted to the “ATA” batch by virtue of a flatter roofline when viewed from the front (or rear). Some of this Roe bodied batch, including the vehicle shown here, were fitted with an illuminated offside advertisement panel and a design flaw meant that this allowed water to penetrate the bodywork. Unfortunately these bodies proved to be structurally unsound overall and as well as leaking from the outset strengthening kits had to be supplied by Park Royal for the floors of both decks due to waistrail movement. Within only a few years widespread rust necessitated the complete rebuilding of many of these buses and premature withdrawal of others. In this photograph of No.899 at Newton Abbot bus station we can see that the destination equipment has been lowered (in 1971) from its original position for OMO and that NBC style fleet names have been applied to the sides, although the pre-NBC “Devon General” legend remains below the windscreen. This photograph would have been taken between 1973 & ‘75 as in 1976 No.899 was rebuilt and re-entered service in the NBC poppy red livery. In 1980 this bus was one of five of the batch to be outshopped at Newton Road in NBC all-over green, although retaining “Devon General” fleetnames. It was withdrawn and scrapped the following year. The 719T includes a powerful 1-horsepower motor and a heavy enclosed steel cabinet for plenty of storage (view larger). 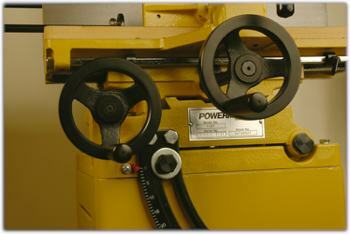 The Powermatic 719T isn't just a mortiser; it's a high-tech joint building lab. Its large wooden table (measuring 20-1/4 inches by 7 inches) gives plenty of work support and will adjust to any angle between 0 and 35 degrees. The table can also move left to right and forward and backward on dovetail ways with the large hand wheel controls. Adjustable linear stops and a flip-down stop allow for precise repetition. The quick-adjust clamp provides plenty of work-holding force and swivels to accommodate angled work pieces. The heavy enclosed steel cabinet provides plenty of storage inside for chisels and accessories. It's backed by a five-year limited warranty. One Powermatic 1791264K 719T tilt table mortiser; wooden table; operating handle; chuck key; enclosed stand with shelf; bushings to fit 5/8-inch, 3/4-inch and 1-1/8-inch chisel shanks; work stop assembly; and operating instructions.